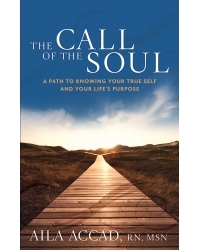 The Call of the Soul presents a new perspective on the quest to find your authentic self. When that quest is successful, you know who you truly are and what your life’s purpose is. This book provides a new way to approach the journey, with a map and effective tools to ease the struggle and assure success. The Call of the Soul shows you how renegotiate the relationship between the ego and the soul so you can step fully into your purpose. Step by step, you will discover inner passion, purpose, peace, prosperity, and love—all by learning how to hear the call of your soul. With a down-to-earth writing style combined with true-life examples, this book offers accessible wisdom to achieve the self-knowledge you are seeking. 34 Instant Stress-Busters. As a stress expert and healthcare futurist, she is a popular keynote speaker and radio and television guest. Aila lives in the beautiful hills of Charleston, West Virginia.